On the Resolution 2018 platform this evening are three works that explore tension in quite different environments. The first is Autin Dance Theatre’s Dystopia, a duet with Johnny Autin and Laura Vanhulle and dramaturgy by Neus Gil Cortes that goes over the familiar ground of an embattled relationship but in a dynamic, almost brutal physical vocabulary that is nevertheless refined in its emotional heft and tender in its resolution. Autin is a powerful, acrobatic dancer whose fluidity allows subtle narrative interpretations to permeate his choreography and in Vanhulle he has found a match in strength and breadth of styles with a naturally fluent expression; the two can stare each other down, explode in frustration or melt into understanding with equal measure. Dystopia is, according to the program note, ‘looking at our human need for connecting and belonging, in opposition with our modern anxieties based on fear and violence.’ In terms of the physical language of dance, connection is common to both ‘belonging’ and to ‘violence’, which is what creates the tension in Dystopia. The distance between Autin and Vanhulle is constantly stretched or diminished with a force that, until the very end, remains unresolved. Richard Shrewsbury’s sound plays a parallel role in the work, at first creating a thick aural atmosphere then piercing it with words as emotions (though I’m not sure they are necessary) and finally distilling it delightfully into a Scottish reel. Having given all they have got, and given as much as they receive from each other, Autin and Vanhulle expel the tension between them in a final gesture of belonging. Elinor Lewis and Nuria Legarda Andueza’s Orchard is a deceptively calm oasis of a work constructed and performed with a fine precision that becomes its focus. 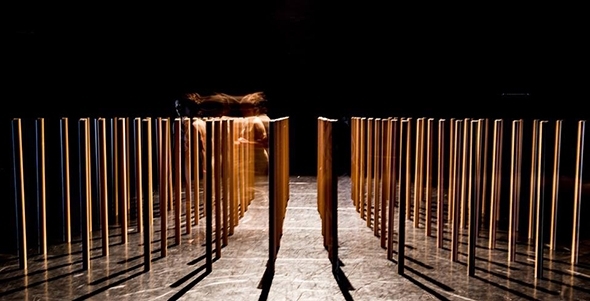 The set, designed by Lewis, is a precise grid of identical, chest-high vertical poles that have an air of solidity in the stillness and silence of the opening image of Lewis and Andueza standing like Egyptian statuary in a cornfield looking across at each other over the top of the stalks. Their game is to move towards each other without touching any of the poles but they move so meticulously and almost imperceptibly it’s like watching paint dry except for the inherent risk of miscalculation. I calculate it will take five minutes for them to meet in the centre aisle of the grid and it does. But then the trajectories change; the women back up, rock slowly side to side, and then dart like a knight in a chess game to a new space. The sense of tension builds in the audience as the nature of the game wrestles constantly with the stability of the poles and as subsequent spatial challenges are overcome relief and disbelief are equally expressed in laughter. Orchard is a simple concept that is paced to perfection; Lewis and Andueza calm us down by lying like twin halves of a pediment fitted neatly between columns and then slide gently through the grid as if the game is over. When we least expect it, with quick birdlike movements of the head they suddenly roll over and knock down the poles around them. With a look of sheepish surprise they confirm in this one stroke the true nature of their game and of their achievement. It’s ironic to follow a piece about topographical limits with a work called Where is my border? but the two couldn’t be further apart in content. From the silence and precision of the one we lurch to the emotional turmoil and disorder of the other. The subject of Luca Braccia’s work is not conceptual but visceral, the deleterious effects of Post-Traumatic Stress Disorder (PTSD) in war veterans. However, in appropriating the physical language commonly associated with the symptoms of PTSD — such as the jerked repetitive movements and contractions from shell shock victims in World War 1 hospital films and from the visual currency of news reportage and Hollywood blockbusters — he fails to acknowledge the psychological pain that underpins it. The result is a depiction of trauma that lacks its visceral quality. To succeed in finding an artistic means of expressing trauma that can engage the spectator with its emotional disarray, effect has to give way to the impenetrability of a disorder that ambushes the sufferer with its mental and physical anguish (think of Crystal Pite’s Betroffenheit). Braccia’s sound montage gets closer to creating a dark, suffocating aural environment but his dancers are too robust and in control to render with equal force the distress of PTSD. For all its energy, Where is my border? moves us not towards the affect of trauma but away from it. As the opening work of this second iteration of Cloud Dance Sundays, B-Hybrid Dance reprises Foundations, which I had seen at the Cloud Dance Festival two weeks before. The shortcoming I noted then is just as stark here: a static reading of the lyrics that leaves the music for the most part stranded. The brief solos of Eloise Sheldon and Jumar Aben show that choreographer Brian Gillespie is not insensitive to the musical inspiration, but such a literal interpretation of the lyrics ‘I climbed a tree to see the world’ as a dancer climbing the backs of her colleagues or of ‘I held on as tightly as you held on to me’ as the line of dancers linking arms over shoulders limits Gillespie to a one-dimensional response to the musical line. Julia Pond is only four generations removed from the first teachers Isadora Duncan formed at her school; before dancing three works to the music of Schubert and Chopin, Pond gives a short introduction to Duncan’s legacy. It must be difficult to give life to the work of a dancer who was active at the beginning of the last century, but there is a freshness and freedom in Pond’s interpretation. The rhythm of each dance is in the feet while the beauty is in the upper body and Pond must have a powerful pair of lungs to keep her breathing so controlled and calm throughout the exertion. If the beautiful photograph by Arnold Genthe of an ecstatic Duncan with her head and arms raised is any indication, all that is missing in Pond’s performance is the abandon and longing that I imagine arose as much from Duncan’s lifestyle as from her dance style. There is a similar reserve in Pond’s own choreography, Take/Give, in which she sports enticingly with yards of flowing white cloth. Despite the voluptuous nature of the imagery and of the voice of Leonard Cohen (Take This Waltz), our connection to Pond keeps its distance on the edge of emotion. Perhaps Duncan’s art was so radical in its time that we still expect to be seduced by it, but like the value of money 100 years ago, it takes a lot more now to match it. There is very little historical about Nina von der Werth, a recent graduate of London Contemporary Dance School, who is clearly influenced by reality television and conceptual dance. Francesco appears on screen to introduce the work that is based on his recent heartache. His commentary on losing his partner, to whom he refers as ‘my little yellow fairy’, takes on the nature of the performance and he is so plaintive and over the top (to a piano accompaniment of Someone Like You) that the audience is not sure whether to laugh or to get out their hankies. The real Francesco appears on stage and Tori, who plays his late love interest, appears in a flurry of yellow feathers to a live recording of (yes) Coldplay’s Yellow. This is already the climax of the work and there is not very much else to say though the duet continues to wild applause (from Coldplay’s performance) and some rather clunky partnering on stage until the departing Tori looks back at Francesco’s despair with calculated pleasure and runs off. Perhaps it should be Francesco who sweeps up the feathers instead of the stagehand. Either way, the feathers do not cooperate with the broom and have to be picked up one by one. A wooden stool is placed on stage and Johnny Autin steps up to turn slowly, like a revolving mug shot, to a hypnotic violin track (Cajon by Daniel Waples and Flavio Lopez). There is a certain defiance in his strong rounded features. Taksim Square is a work in progress that refers to and is inspired by ‘the recent Turkish protests against Prime Minister Erdogan’s government and the violent clashes with the riot police in Ankara and Istanbul.’ Autin passes his hand across his face, then examines his hand in detail. From these small gestures, he builds up an intense physical portrait of repression that courses through his entire body. At one point he takes off his t-shirt to create a brutish, faceless choreography of the muscles of his back. His mime is clear and his articulation is imbued by a violence that is never far below the surface. Another musical track (the dance inside by Ceccal) accompanies his lightning gestures — a ferocious, internal struggle for sanity — in a square of light like a cell. His arms rise again in a fist, then an open hand, trembling; he suddenly and violently slaps his face, looking ready to explode; his eyes trust no one Once out of his square, facing unseen opponents, his entire body is shaking, answering gesture for gesture with a full-out body language. At the extremes of physical endurance, he nevertheless expresses a calm that reflects his unbowed, unrepentant core to the end. A remarkable performance.